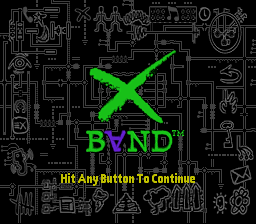 The XBAND modem was a piece of hardware for the SNES and Genesis which allowed online multiplayer for a limited number of games. Despite its innovative concept and features, it was financially unsuccessful and the service was discontinued less than two years after its release. The avatars are completely different in the Japanese BIOS and I recall there being some unused ones here. Press Up, Right, Down, Left, Up, Up, Left, Right, Left, Right, Down, L on the Option screen. A Memory Viewer will appear in the menu. It appears to be a full fledged Memory Viewer with a command line on the bottom. Start - Quit the Memory Viewer. Select - Change the mode between Hex, ASCII, and Command Line. Up/Down - Scroll address by line. 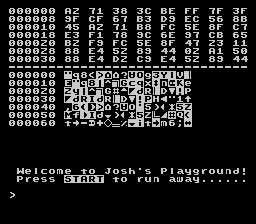 A - Change view mode between Hex and ASCII, Hex only, and ASCII only. B/X - Increase/decrease chosen address digit. Y - Go to long address (chosen in the memory in little endian). L/R - Increase/decrease address by 1. L/R - Change current letter. 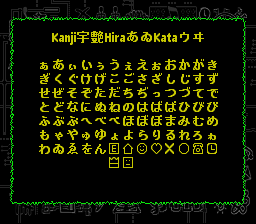 In the Japanese version, press Up, Right, Down, Left, B at the main menu. Present at E92F2 in the Japanese BIOS. Our use of beans assures a good taste. Hey Andy, what's the POP number? WHAT ARE THE X3 PARAMETERS? why should you have to beat off an elephant? ...Out of Sight is Out of Mind. The lines "Leave all Love and Hope Behind, Out of Sight is Out of Mind." are from the Bedlam scene in Igor Stravinsky's 1951 opera The Rake's Progress. This page was last modified on 30 September 2016, at 18:58.